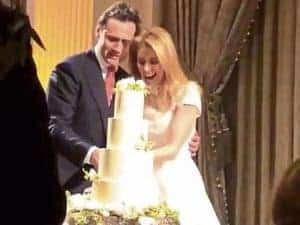 SKY Sports presenter Rachel Wyse celebrated her wedding to showjumper Tim Gredley at 5-star Adare Manor. The couple have been together for over two years. The stunning bride, who hails from Dublin, married the millionaire showjumper surrounded by family and friends, including her colleagues from Sky Sports. The spectacular Grand Ballroom, which can host 350 guests, was decorated with towering green foliage and flowers for the celebration. They first met years ago in show jumping circles but it was only when they met again in recent years that they began a relationship. Rachel said the pair “just click, I met Tim 13 years ago at a horse show in Cavan. I was jumping and he had horses. But then nothing happened and all these years later, we met again.” She enjoyed leisurely walks in the manicured grounds of Adare Manor in her horsey gear of hunting boots and wax jacket just hours ahead of her big day. The wedding party also enjoyed a fun-filled evening in the Manor the night before the big day. Wedding guests included Rachel’s Sky Sports GAA colleague, former Dublin footballer Senan Connell and her former Sky Sports colleague Natalie Sawyer.